Are you joining your friends on a motorbike expedition this weekend? Then get your gear ready to protect yourself. The motor bike gear consists of helmet, jacket, pants, boots and gloves. 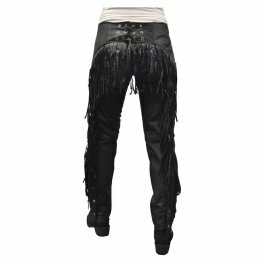 Besides this you also need women’s leather motorcycle chaps. Like the jackets the pants are made of leather or textile material which is provided with CE- rated armor in the knees, hips and shins. 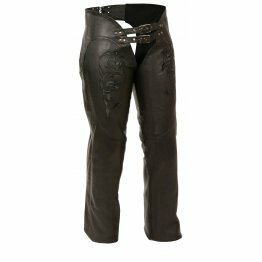 Leather chaps women are designed to fit snugly and allow articulation in the full leg. 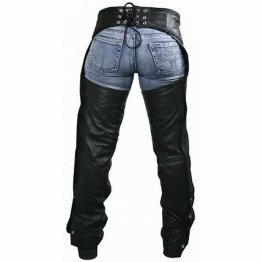 Leather riding chaps for women are brown, black, red pink and other colors. The chaps are of different types like leather riding chaps, leather western chaps and half chaps all made of genuine leather.Once you are clad in your motor cycle gear you can travel interstate without any danger. American buffalo leather has a rustic earthy look with a distinct grain pattern. Black buffalo leather is exceptional and breathable and can keep your warm when it is cold and provide coolness when it is hot. The leather is resistant to cuts and abrasions and releases moisture. These pants can only be available online. Insulated motorcycle chaps are for women bikers who will not let cold winds come in the way of their bike ride. On mornings when weather is brisk just zip of the lining and go on the bike and when the weather gets warm zip out the lining. These chaps are crafted from black leather and have zippers on the side. 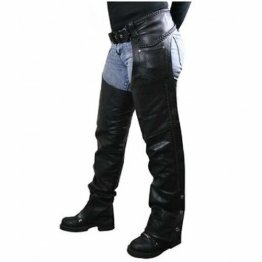 The insulated leather chaps are designed to fit any body shape and size whether man or woman. It has an adjustable waist with belted front and as back panel with lace-up for a custom fit. The length of the chaps can be cut to fit the size required. Leather chaps women give the biker the look of a cowboy. Heavy duty chaps come with lining and flap cover with zippers on the side. It is not easy for a woman to be on the road with a bike. To offer maximum protection there is a large collection of leather motorcycle chaps at affordable prices. Wearing motorcycle chaps is not the most convenient. 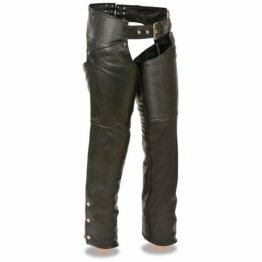 They do not have any style so women mostly opt to wear leather pants and prefer not to wear chaps. Online motorcycle stores have come with textile pants with armor to cushion a crash and protect the biker from serious injury. Women riders opt for the best hence most online retailers for motorcycle gear have brought together a large number of brands and products to help them make a choice. 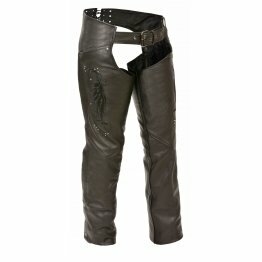 Now women riders can opt for some of the best leather chaps. 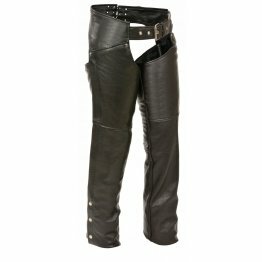 Since Leather chaps women are designed by experts in the field they not only offer the best fit but are also stylish. Most women riders like their riding gear to be personalized to match their styles. 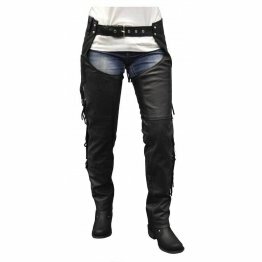 Most of the brands have come with leather motorcycle chaps for women with special features like adjustable laces in black or other colors. They are tapered or have boot-cuts besides having full zips for easy on/off. The styles are hip-hugging or thigh stretching. There is a self- adjusting belt to help adjust to size. Those who like additional weather protection the chaps are lined with mesh. 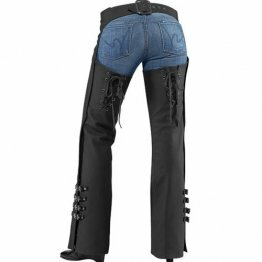 There are many companies that have women’s motorcycle pants and chaps crafted for women’s shape and style. 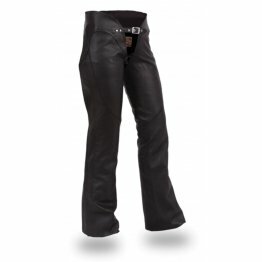 Whether you are a long distance touring rider, racer or pleasure rider there are pants to meet all your requirements. 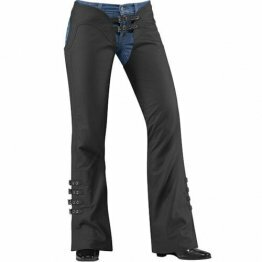 Women’s motorcycle pants for everyday riding come with loser fit and reinforcement panels in areas of high impact. Track pants and Pants for sport riding have snug fit and are pre-shaped with stretch panels, ventilation, knee sliders and 360*zippers to attach to jackets. They come with varying sizes, styles, shapes to meet every woman’s needs. 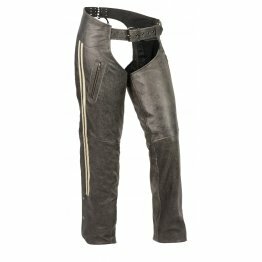 If you like to join the motorcycle riders chose motorcycle pants and chaps that meet your unique style.